The Mercedes Benz G-Wagon is a safari car everyone can love, despite its recent usurpation by fashionistas and the affluent douchebag class. For 2009 the Galendenwagen gets the three bar grille spreading like a virus from Ford to Mercedes, and new wheels, but more importantly a much more powerful engine. 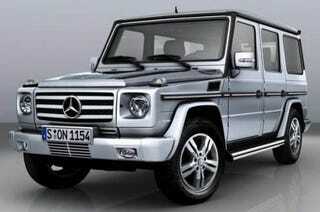 For '09, the G500 is going from 292 HP and 336 lb.ft. of torque to a stonkin' 382 HP and 390 lb.ft. of twist. For you numbers nerds out there thats about a 30% improvement in power and 16% better on the torque end. Not bad for a platform pushing thirty years old. But what about the AMG version?